Experience, affordability, and quality of work are the top things to look for in a prospective repair service. Do some research to find out how long the shop has been in business and the rates they charge. Web reviews will give you a good picture of a body shop’s quality — especially ones that are descriptive and thoughtful. You should always ask for a detailed, written estimate from the shop you’re interested in working with, including charges for labor and parts. They should also contact you before performing any work not specified by the estimate. 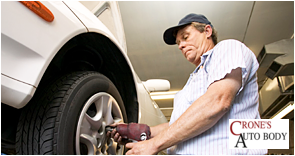 Every so often, your car will encounter further issues after your repair, but you can get these remedied as long as you act before your warranty expires. If you’ve made sure your bill corresponded with the work performed, any problems should be fixed quickly and efficiently. If you’re looking for the best auto body shop in Covington, KY, you can rely on Crone’s Auto Body. Request an estimate by calling (859) 356-1800, or read their FAQ page for more information about their collision repair services. Does Car Insurance Cover Dent Repairs for Hail Damage?